As a professional photographer with a pretty large social media following, I get a lot of questions from complete strangers. What camera (or lens, or tripod, or whatever) should I buy? What were your settings for this picture? Did you use a filter? What’s the best time to photograph such-and-such a location? Because I don’t believe there should be secrets in photography, I do my best to answer these questions as quickly and completely as my time permits (though it seems that the time I have to answer questions decreases at about the rate the volume of questions increases). Among the most frequently asked questions is, “Where did you take this picture, and how do I get there?” But, despite my “no secrets” policy, I’m no longer as free with location information as I once was. I can cite (at least) three reasons, none of which is a desire to prevent others from duplicating my shot (the best photography requires far more than location knowledge anyway). 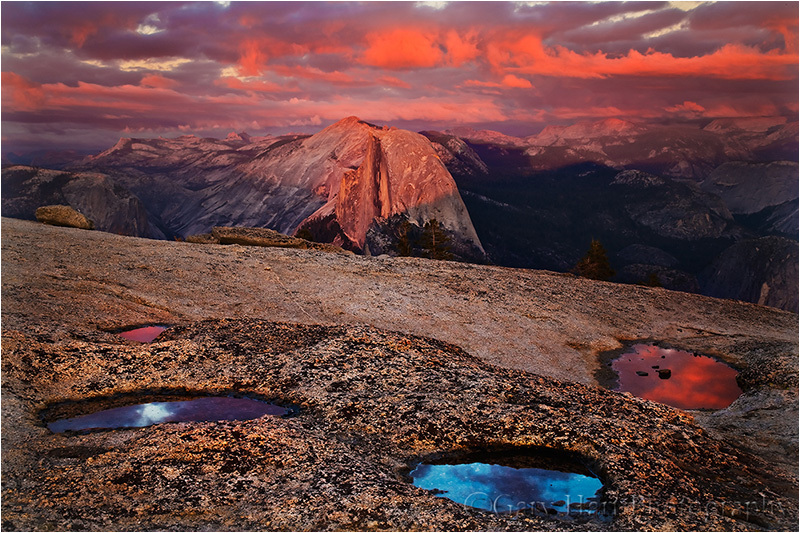 I’m disappointed by the laziness of many photographers who simply want to duplicate an image they’ve admired. (No, I don’t think that simply asking for a location automatically makes you lazy, and in fact have been known to ask for location details when something about a spot interests me—but identifying a location should be the photographer’s starting point, not the goal.) I’ve seen enough duplicate images to know that I don’t want to perpetuate the epidemic. Sadly, the quickest way to ruin a location is to invite photographers. It seems that as soon as the word is out about a new spot, it becomes impossible to visit in peace, and even worse, to enjoy it without having to face the damage done by photographers who preceded you. You’d think that people who photograph nature would take better care of it, but that doesn’t appear to be the case, at least not for everyone. It’s unfortunate that the actions of a few can ruin things for everyone, but these disrespectful few are far more visible than the respectful majority. The more photographers try to squeeze into spaces too small to accommodate them, spilling into fragile areas, crowding out tourists with just as much right to be there (“Hey, you’re in my shot!”), the more fences and rules are installed to keep us out. I’d love to be wealthy enough to make myself available as a fount of photography information to all who ask. But because photography is my livelihood, I have to balance the time I spend against the income it generates. When people pay me for a photo workshop, not only do I like to guide them to all the locations they’ve seen in the pictures, I also like to be able to give them perspectives a little off the beaten path and less heavily photographed. For that reason (and the fact that I just plain enjoy doing it), I spend a lot of time researching: Scouring maps, studying books, and googling before I visit for sure, but more importantly, polling locals and exploring independently (Hmmm, this road looks interesting…) once I arrive. This takes time, sometimes a lot of time. I bring all this up because the image today was captured at a location that Don Smith and I “discovered” (it’s not as if we’re Lewis and Clark, but you get the point) while scouting before this year’s Columbia River Gorge workshops (back-to-back, collaborative workshops organized by Don and me). Despite our familiarity with any location, Don and I always allow time to explore for more spots on every visit. Which is how we found ourselves bouncing along dirt roads and traipsing up and down remote hillsides on both sides of the gorge earlier this spring. When we found this spot, Don and I immediately agreed on two points: 1) We have to take the workshop groups here 2) Too many photographers would destroy this place. And since the surest way to invite a trampling hoard of photographers is to share directions to a location, I won’t do that. But here’s a tip: some of my favorite photo spots have been found while searching for other spots. So, after cautioning our groups to treat each destination with care, we did take them to this new spot. 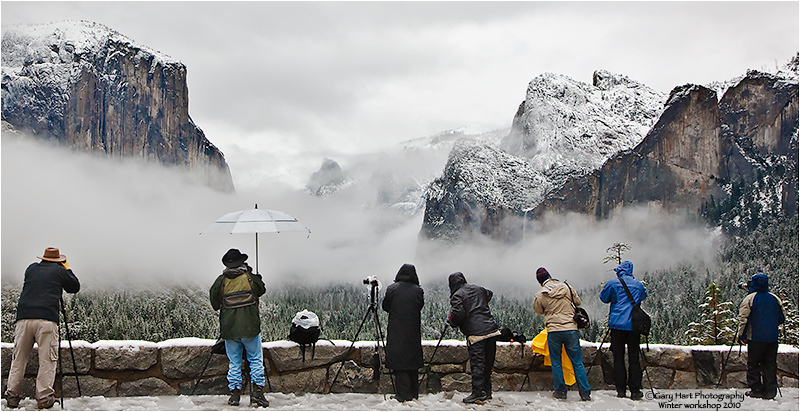 The first group had to contend with 30 MPH winds—we made those shots work by bumping our ISOs and concentrating more on views wide and distant enough to minimize motion blur. The second group landed here in a gentle breeze that ranged from slight to nonexistent, allowing us to get up close and personal with the flowers. The image I’m sharing today came right at the end of the second group’s visit. The sun had been down for about ten minutes, but because the light was so nice, and the color seemed to linger in the sky above Mt. Adams, I just couldn’t bring myself to leave. With my lens just inches from the flowers, even at 16mm and f18, complete front-to-back sharpness was impossible. Forced to choose between foreground or background sharpness, I opted to make the trio of yellow balsam root in my foreground sharp, and let the background go a little soft. By this time it was dark enough that I bumped my ISO to 3200 to ensure a shutter speed fast enough to avoid motion blur. In family Hearts games when I was a kid, I loved to “shoot the moon” (tremendous reward for success, extreme cost for failure). But simply wanting to shoot the moon wasn’t enough to make it happen, and I didn’t really start winning until I learned to separate my desires from the reality of the moment—I know now to evaluate my cards when they’re dealt, set a strategy, then adjust my strategy as the game unfolds. It’s that way for most card games, and it’s that way with photography. So much of successful nature photography is about flexibility, an ability to anticipate conditions, establish a plan, then adjust that plan when things don’t play out as expected. That’s why, given nature’s fickle tendencies, I’m never comfortable photographing any location without backup options. I was reminded of this during my recent 10-day, two photo workshop trip to the Columbia River Gorge with Don Smith, where rapidly changing Pacific Northwest weather makes flexibility the name of the game. The Columbia River Gorge offers a full deck of photo opportunities that include numerous waterfalls in the gorge’s steep tributary canyons, mirror reflections of Mt. Hood and Mt. Adams in small lakes south and north of the gorge, and spring wildflowers blanketing the eastern gorge’s more exposed slopes. Of course merely showing up at a spot and expecting great captures isn’t sufficient: Waterfalls are dramatic subjects the camera struggles to capture in brilliant, midday sunlight; towering volcanos are the first subjects disappear when it rains; and I can photograph wildflowers all day—as long as there’s no wind. During our workshops, Don and I had to shuffle our groups’ photo locations and timing around snow, rain, and clear skies, temperatures that reached the 80s and dropped into the 20s, and winds that ranged from calm to 40 MPH. Our plan for clear skies was to head to the volcanos; if we were dealt clouds and rain, we would use the diffuse light (subdued dynamic range) to concentrate on the gorge’s waterfalls. And rain or shine, the wildflowers were ideally positioned for sunrise and sunset if the wind cooperated. Somehow we managed to pull it all off, our trip culminating with a sunrise jackpot on the final morning of the second workshop. 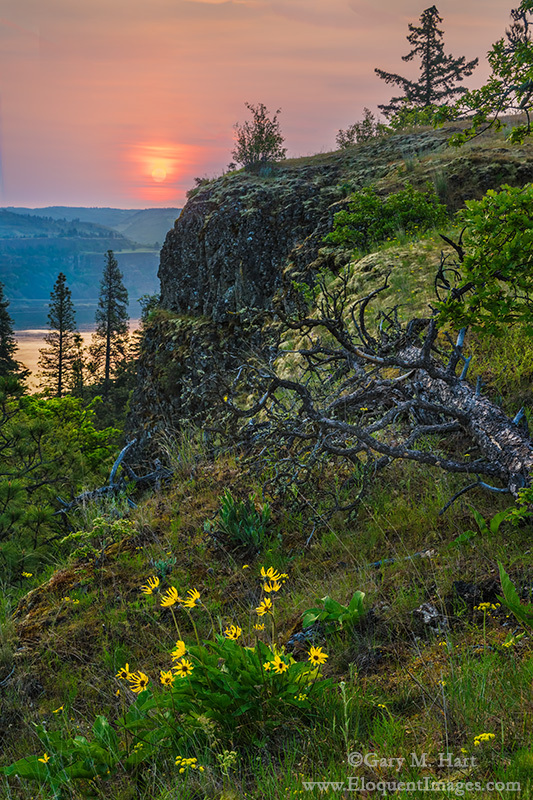 The plan that morning was a vast, exposed, wildflower-smothered hillside on the southwest end of the gorge. I’d been monitoring the weather obsessively throughout the trip, and with the morning’s forecast calling for clear skies and calm wind, Don and I were looking forward showing the group these wildflowers backlit by the rising sun’s warm rays. Despite our optimism for the morning’s shoot, as the group gathered in the dark, a chilly breeze gave me pause. The breeze stiffened on the drive to our planned location, and rather than cling to our original vision and attempt to photograph dancing wildflowers in low light, I started considering options. Don and I had done extensive scouting in the area on multiple prior visits, and had arrived two days before these workshops for more scouting and to get a handle on conditions. My mind immediately jumped to a sheltered location just a short distance from our planned spot. This location had wildflowers too, but instead of being all about the wildflowers, we’d have lots scenes with rocks and trees above the Columbia River, allowing the clumps of balsam root, lupine, and paintbrush to serve as accents. This location’s advantages were that its primary subjects (rocks, trees, river) would be less affected by wind, and its wildflowers would be a little more sheltered. The group ended up with an absolutely wonderful shoot that made Don and I look like geniuses. The morning started with a pink sky that reflected beautifully in the river, and ended with an orange ball of sun floating low above the horizon. There were more than enough wildflowers go around, and wind was much less of a problem than it would have been on a more exposed hillside. No shoot is a guaranteed success—sometimes nature’s cards just don’t fall right. But the more options you have, the more you read and respond to conditions, the more winners you’ll come home with.